Power In A Union is a website edited by Tony Burke designed to provide information, news, views and comment on UK, European and Worldwide trade union and political issues, and to provide a forum for debate and discussion. It is a great privilege to make this tribute to John, it has been drawn up with respect, with sadness and love by several of his old comrades as well as myself. The London GPMU Retired Members’ Association and the trustees of the GPMU Charitable Fund also wish to be associated with it. John Mitchell, a fondly remembered comrade and friend who stood to defend workers in print, in British industry and everywhere when workers were under attack. His first stint as FOC (Father of the Chapel, or lead union rep) was at Barclay & Fry in London in the early 1960s, then at Thomson Publications and later at the Daily and the Sunday Express. As FOC at the Express according to one of his former members “John was a bloody good FOC, he negotiated the Pension Scheme and was responsible for implementing the three day week” – that’s full time hours to you and me, and the pension deal came at a time when very few production workers in Fleet Street had no such comparable conditions!! From the start, John was a true internationalist, supporting and participating in initiatives for political prisoners held in Franco’s fascist regime, and became the Secretary of the Printers’ Movement for Peace in Vietnam. 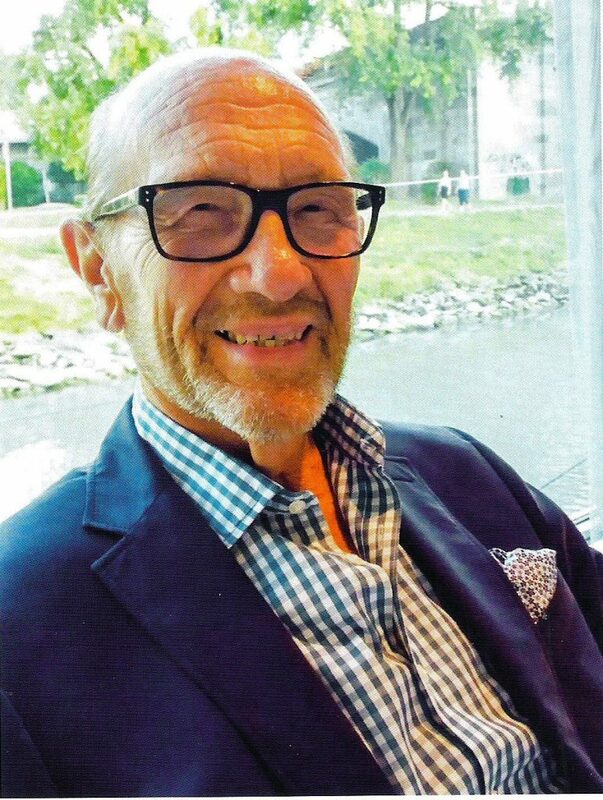 He was elected Assistant Secretary of the London Machine Branch of NATSOPA in 1974, and Secretary in 1976 polling more votes than all the other candidates put together. John was elected just as the political climate was beginning to turn in favour of an employers’ offensive, determined to roll back the so-called frontiers of socialism. He gave up smoking when Thatcher’s government was elected – the only positive feature of that fateful day. As Branch Secretary he headed up, ensured or encouraged support for many struggles with employers, on a variety of issues, including right of reply support for chapels’ protests over lies and distortions printed by newspapers and, notably, engagement of women in the heavy duty jobs in Fleet Street machine rooms. He led the first hot metal to photopolymer negotiation at a local newspaper. There were numerous print struggles during John’s period as the Joint Branches’ Secretary in London on jobs, pay, conditions. The Times Newspapers lockout 1978 – 1979 was the most prominent. It lasted 11 months but John oversaw his Branch’s clampdown and re-organization of the allocation of casual work which enabled people to have some work to help keep them going and the outcome was restoration of jobs and rights. He also promoted good relations with the other print unions to facilitate joint activities during the dispute. With John’s encouragement and support during the 1970s and 1980s there were many solidarity actions: the imprisonment of the dockers in 1972, when John and others toured Fleet Street calling on chapels to stop work; the Grunwick dispute in 1977 when lies printed in newspapers about the dispute were challenged by chapels, and print union members were urged to attend the picket line; solidarity with NHS workers in 1982 which was the last time Fleet Street was brought to a complete halt. Relations with the miners during their struggles were strong especially with the Kent NUM. John’s members provided support for most NUM areas, but sometimes a bit of creativity was called for such as when 500 turkeys somehow flew out of Smithfield for the turkeys and toys Christmas appeal. But his organizational skills were found to be lacking when, on the much publicized food convoy John’s van broke down, only to be subsequently diagnosed as lacking petrol! Seriously though, John’s organizational abilities were well known, together with his meticulous approach to everything he did. He was well-respected by everyone even, and I dare say especially, by those who often disagreed with him. He was kind, considerate and brave, and supportive of colleagues and comrades alike, the only downside was his tendency to use five paragraphs in his many letters and memos when one might have been sufficient. In 1985 John was elected as national Organizing Secretary of SOGAT. Among his many achievements he initiated a complete reappraisal of the union’s organizing model supporting new recruiting activities, and was also responsible for the creation of the union’s equal opportunities policies, supporting a series of key and ultimately successful equal pay struggles. He remained as a National Officer in the Graphical Paper & Media Union until he retired in 1998. During those last 13 years in office he helped to steer the union through the sticky problems of achieving amalgamation at all levels of the new union, finding time to organize the fight for justice as a consequence of the Maxwell pension crimes, and several other cases of pension fund swindles. This man speaks for us all of us who worked with John.He was indeed a man of warmth, courage and commitment. 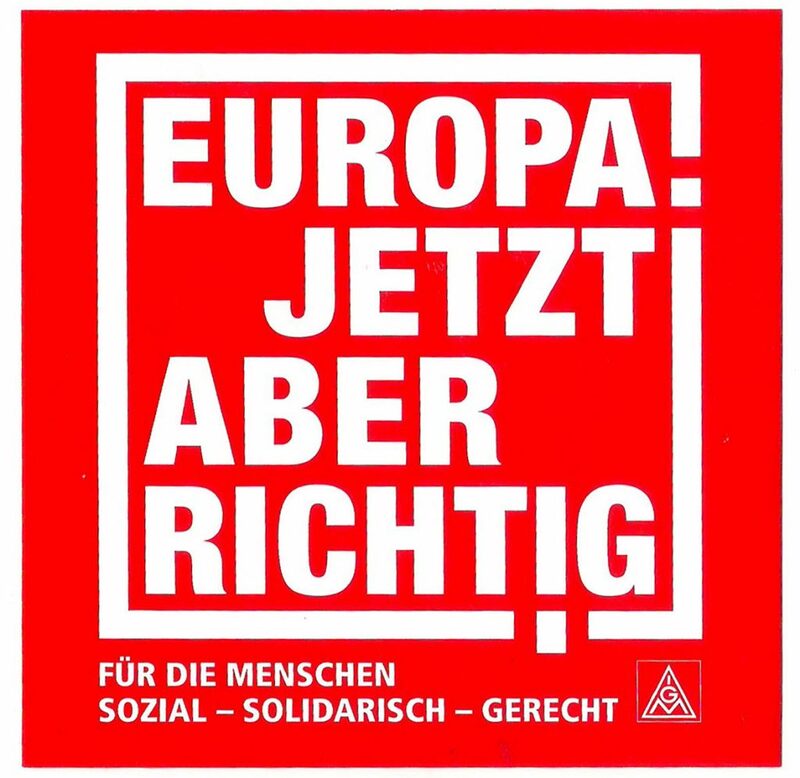 Click here to download the EU election manifesto of the giant German trade union IG Metall – a very interesting read indeed. Fourteen pages long and very easy to read and in English too. Thanks to Marlene Roth at IG Metall. Last year, on April 7th, former President Luiz Inacio Lula da Silva was jailed for “indeterminate acts” of corruption while millions across Brazil were gearing up for the most important presidential election in a generation. At the time of his sentencing, earlier that year, Lula was leading every poll. At the time of his jailing, Lula was leading every poll. When Lula was denied the right to stand in the election and removed from the ballot, he was leading in every poll. 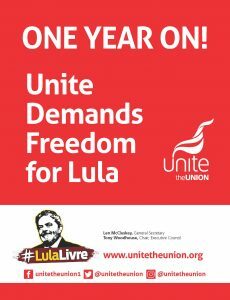 Just weeks before he was removed from the political process, the UN human rights committee officially requested that Lula be allowed to stand, have access to media and have access to members of the Workers Party while he was imprisoned. This was ignored and, subsequently, the man polling second behind Lula won the 2018 election. You will know him as the military dictatorship-supporting, homophobic, racist and misogynistic far-right leader Jair Bolsonaro. Lula’s arrest was not about tackling corruption, but about removing the most popular figure in Brazil from the presidential ballot. For many, this travesty of justice was realised when Bolsonaro appointed Lula’s prosecuting and sentencing judge, Sergio Moro, as justice minister — despite Moro’s continued assertion that he wasn’t interested in politics while orchestrating Lula’s trial. But for those of us who follow Latin American politics, Lula’s political persecution was clear from the beginning. Moro had shown his bias throughout proceedings, illegally wiretapping Lula’s legal team and family members and appearing at public events depicting Lula as guilty before the trial process was concluded. This would not have been allowed by the British, EU or even US judicial system. Not only did Lula face political persecution to remove his political rights, he also faced a trial by media. Major news outlets continually depicted Lula in prisoner’s clothing and blamed Lula and the Workers Party — without evidence or logic — for a corruption scandal involving almost every major political party in the country. The far-right used the perception that the Workers Party were corrupt as one of their main campaign focuses, painting Bolsonaro as an outsider who would be tough on political corruption. Of course, Bolsonaro is now facing his own corruption allegations involving his family, money laundering and a paramilitary group involved in the tragic assassination of councilwoman Marielle Franco. Just like the 2016 coup against Dilma Rousseff, Brazil’s right wing used real public anger at political corruption to remove their opponents and take power through undemocratic means. Lula’s jailing is not just a travesty of justice, it’s a travesty of democracy that has seen authoritarianism knocking at the doors of Brazil for the first time since the fall of the military dictatorship. Lula was a former union leader from the north-east of Brazil who played a pivotal role in organising trade union action against the military dictatorship. He peacefully fought the far-right then, as he does now from his jail cell. But it’s not just Lula’s freedom that is at stake. Lula’s two terms saw Brazil lift millions from poverty with a series of world-renowned social programmes and workers’ and trade union rights enshrined in law. His policies for the younger generation have also had a huge effect, implementing a “nutritional revolution” that massively reduced child malnutrition as well increasing Brazil’s education budget and access to higher education for low-income Brazilians. Bolsonaro’s first months have made it clear he is planning to roll back over a decade of social progress under Lula and the Workers Party. His call for Lula to “rot in jail” show that it is not only Lula’s achievements that under threat. That is why millions in Brazil, and across the world, are calling for Lula to be freed and for his political persecution to end. Supported by international trade unions, and by unions here in the UK, there are demonstrations taking place in major cities across the globe on April 7 to mark one year since his jailing. 1. Help us get to 4,000 signatories our petition against Trump’s ‘regime change’ agenda. We are within touching distance of getting 4000 people to sign up against Trump’s interventions in Venezuela. Help us reach this target by signing here, sharing on Facebook here and retweeting here. 2. Solidarity with Bolivia – next in Trump’s firing line? 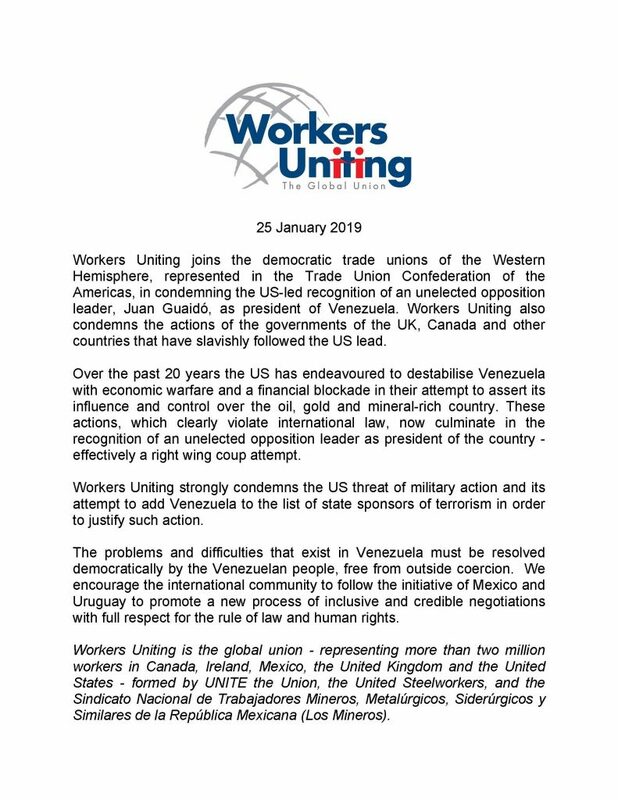 You can find out more at this event on April 30 with Dan Carden MP, Bolivian trade unionist Manuel Bueno and others (on Facebook here) and show solidarity by signing this statement here plus sharing on Facebook here and Twitter here. 3. EVENT: Brazil- Stand with the Resistance Against Far-Right Bolsonaro, March 28, 18.30, Hamilton House, WC1H. With an eyewitness report back from Julia Felmanas of the Brazilian Workers’ Party, who recently returned from the country, CND’s Kate Hudson and Danielle Rowley MP. You can share on Facebook here and get tickets here. 4. Say no to Trump and May’s hypocrisy on Honduras – sign the petition against spyware sales! It is nearly ten years since the right-wing coup in Honduras (an issue we led the campaign about at the time) and people there are still suffering from both vicious neo-liberalism and severe repression of progressive movements. Whilst the Trump and May governments are keen to intervene in Venezuela, they continue to prop up this reactionary regime in Honduras, including in Britain’s case through spyware sales. You can sign a petition here, share on Facebook here and Tweet here. Please see this important message and petition from Honda workers in Swindon, whose jobs are at risk. We are the workers from Honda Swindon. We urgently need your help. Honda has said that in 2021 it will close the plant in which we work. 3500 direct jobs and possibly 12,000 jobs or more across the country will be lost as a result. The fallout will be felt in jobs and communities across the south west and the UK. But we believe that this economic and social catastrophe can be averted. Our workforce at Honda are skilled, dedicated and efficient and together with the supply chain we are dedicated to making this company succeed. Yes, these are challenging times for this industry but with vision and commitment, the UK can be the world leader in the new technology car manufacturing needs to thrive. Honda is well positioned to benefit. So we are urging Honda to think again. Honda, do not turn your back on a world-class, loyal workforce determined to bring you continued success. We have dedicated our working lives to Honda Swindon. Through our hard work this company has thrived – all we ask now is the chance to make our case for the future we deserve. Please help us fight for – and win – a brighter future. It wasn’t supposed to be like this was is it? International Trade Secretary Dr. Liam Fox, currently second in the incompetency stakes behind transport secretary Chris Grayling (but just in front of Gavin Williamson) once told the UK that getting new trade deals to replace the loss of the biggest trade deal of all with the EU would be easy. He told the nation, business and working people that 40 deals would be ready for ‘one second after midnight’ on Brexit day. “We will have arrangements that we will be able to roll over from the European Union’s agreements, we hope to have around 40 of those. We hope we will have all of those in place by the time we go. He went onto say that he wanted the UK to take advantage of ‘being able to negotiate beyond the European Union’s borders’. “We’ve got 14 working groups in place with 21 countries at the present time I’d hope to make as much progress as possible because we need to have a confident and optimistic agenda for Britain’s future,” he said. He told the BBC trade talks had begun with Australia, New Zealand and the USA. Of course it was total hogwash. While Fox was busy racking up air miles and getting nowhere fast in negotiating these phantom trade deals, others were warning that the 40 countries would not just be rolled over – and why should they? The UK was leaving the EU – and they would squeeze the UK for everything they could get. These countries would also want to see what sort of deal the UK struck with the EU. Dr. Fox was given regular reminders by industry and unions that it took the EU over seven years to negotiate the EU-Canada deal (CETA). But he carried on ‘grandstanding’, to quote Labour’s shadow trade secretary Barry Gardiner. That was until last week, when he was forced to admit it was not going as well as expected. Fox had to admit that the government was significantly behind in securing the 40 free trade deals with only a handful agreed so far. It appears only six of the 40 deals are likely to be in place by Brexit day: 30 deals that need to be ready are now considered ‘off-track’. The Department for International Trade is using a system of ‘traffic lights’. The green section includes those that are ‘on track’ and to be implemented by Brexit day – Switzerland, Chile, Israel, the Palestinian Authority, the Eastern and Southern African block and the Faroe Islands (the latter worth £360 million). Yet the document states that ‘risks remain’ even with these deals. There are nine agreements in the ‘yellow’ section, described as ‘off track’, and 19 agreements are in the ‘red’ section, which are ‘significantly off-track’ in terms of deliverability by March 2019 . The countries listed under these sections include Canada, South Korea, Egypt and Jordan. Further agreements are in a list with the heading “not possible to be completed by March 2019” and include Turkey, Japan and Algeria. “The problems with the promises made by Liam Fox have long been evident: renegotiating trade deals is long and difficult work at the best of times, let alone when the UK’s relationship with the EU (its main trading partner) remains unclear. The progress in replicating the EU free trade deals so far amounts to just £16bn of the possible £117bn the 40 agreements cover. Further blows to the government came in the shape of defence minister Gavin Williamson’s foolish announcement that he would be (at some point) be sending our new aircraft carrier Queen Elizabeth 2 to the South China Sea (for what purpose other than sabre rattling and to be a sitting duck – we don’t know). Hammond’s visit was seen as a precursor to the very long road in negotiating a trade deal with China, which will take many years. The Chinese will prove to be just as hard bargainers as Barnier and Tusk. Then came UK’s attempt to persuade Japan to agree a a fast track post-Brexit trade deal. Tokyo reacted to a letter from the foreign secretary, Jeremy Hunt, which told their Japanese counterparts that ‘time is of the essence’ and said flexibility would be required on both sides. The letter, sent on February 8th, did the job in winding up Japanese officials who believed that the letter (which said that “we are committed to speed and flexibility and hope that Japan is too”) accused Tokyo of ‘foot-dragging’. It forced Japan to consider calling off trade talks. The UK needs a deal in place of the EU-Japan trade agreement, which came into force on February 1st, but it had given up hope it coming into force by March 29th. Japan had agreed to extend existing trade terms for the duration of Britain’s planned transition period with the EU. But in case of a no-deal Brexit, the EU-Japan agreement would no longer apply to the UK. Over 18 months of negotiations Japan and the UK have failed to make significant breakthroughs on a trade deal as Japan will not accept a cut and paste job on the terms of the EU-Japan agreement. Instead Japan wants a better deal from the UK than it got from the much larger EU. Then last week Australia, having said they would consider a ‘fast track’ deal poured a bucket of cold water on any UK ambition to join the Comprehensive and Progressive Agreement for Trans-Pacific Partnership (CPTPP). Australia’s trade minister Simon Birmingham said that it was unlikely the UK would be joining the CPTPP deal largely because ‘it is not in the Pacific’. 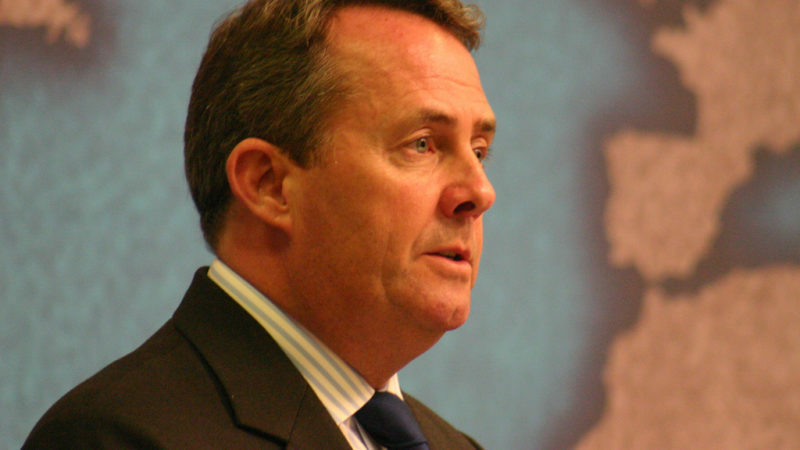 Fox has frequently stated his desire for Britain to join CPTPP, an agreement that includes Australia, Japan, Canada, and several other nations. Birmingham also joined voices urging British politicians to provide clarity on the country’s future trading relationship with the rest of the world. Fox has even managed to damage relationships with industry here in the UK. His department is responsible for setting up the Trade Remedies Authority, which will over see and handle the important issue of tariffs and the dumping of goods on the UK market. A number of manufacturing groups are working with unions including the TUC and Unite to ensure the UK has in place a trade remedies structure to stop dumping of imports of steel, tyres, ceramics, glass, chemicals etc – but this is some way off. Fox has refused to give trade unions a place on the authority – despite employers involved agreeing unions need to be represented. A hapless Fox raised the spectre of zero-tariffs on imported goods with a group manufacturing employers which received a frosty response: “I would urge Liam Fox to think again and think about the damage this plan would do to our industry,” said Dr. Laura Cohen, chief executive of the Ceramics Confederation and chair of the Manufacturing Trade Remedies Alliance. So not a good week for the DIT and the government. Its policy of securing trade agreements to replace our agreement with the EU is in tatters and the UK is staring disaster in the face. Employers are exasperated, jobs are at risk, and other countries are either flexing their muscles or waiting to see what happens. The idea that we can ‘swash-buckle’ our way around the world using gun boat diplomacy is dead. But not to worry: Donald Trump says he is ready to do a ‘great trade deal’ with the UK. We know what that means from a man who claims to be the greatest deal maker on the planet. Meanwhile Dr. Fox pretends all is well. Abdullah Öcalan’s unlawful and inhumane isolation must be ended immediately. Otherwise hundreds of people who are on hunger strike in Turkish prisons and outside Turkey face certain death in the coming days and weeks. Today, 15 February 2019, marks both the 20th anniversary of Öcalan’s abduction and the 100th day of HDP MP Leyla Güven´s hunger strike. The situation now for Ms. Güven and the more than 330 others on hunger strike around the world is beyond critical. By failing to exert pressure on the Turkish authorities to abide by their own laws and constitution and the most basic international human rights standards, the international community must be regarded as complicit in serious human rights abuses committed by the Turkish government. We therefore urge the international community to break its silence. We the undersigned appeal to the government of Turkey to immediately break the isolation of Abdullah Öcalan, and thus open up the way for peace negotiations. 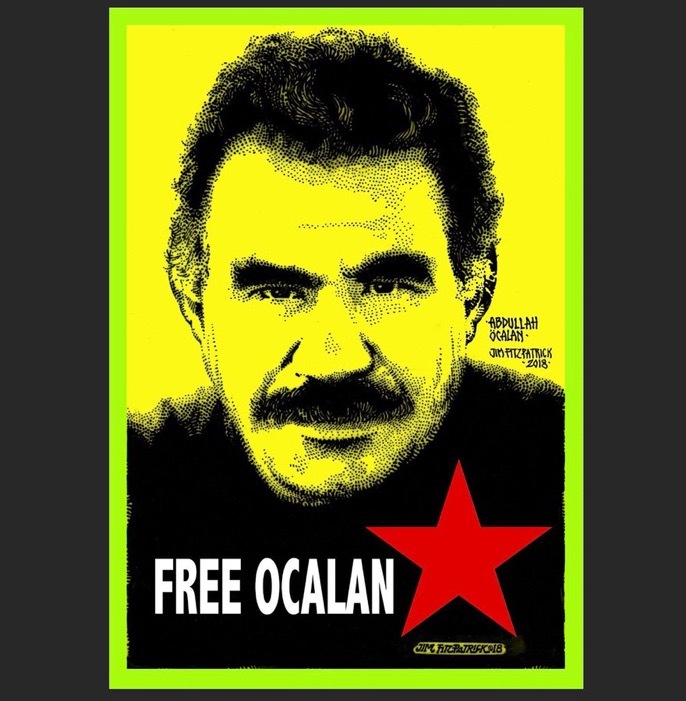 Öcalan has been held in a state of aggravated isolation since 2015, and has not been allowed to contact a lawyer since 2011, in violation of the most basic human rights. The policy of isolation that has been imposed upon Öcalan, and the three others imprisoned on İmralı Island, is not only in violation of International Law and the European Convention on Human Rights, which Turkey is obliged to uphold as a member of the Council of Europe, but is also a violation of Turkey´s own domestic laws and constitution. We regret not having been granted a meeting with the Turkish Minister of Justice in accordance with the request in our letter dated the 21st of January, where we raised our concern for the state of human rights in Turkey, and the systematic practice of imprisonment on political premises. In this meeting, we hoped for the opportunity to voice our concerns and hear the minister’s reactions. We, the undersigned, echo the call of the Council of Europe urging Turkey to authorize immediate publication of the CPT´s findings on Turkey. Furthermore, we would like to call attention to the resolution passed recently by the Council of Europe regarding the worsening situation of human rights in Turkey. The Council expressed their deep concern, calling on Turkey to, among other things, abide by the basic human rights principles adopted by the Council of Europe concerning the imprisonment of Öcalan, release the members of parliament that have been imprisoned, and implement reforms to ensure an independent judiciary. During our visit, we have met with various groups, including the Human Rights Association, the BAR Association, the Democratic Societies Congress, trade unions, the Women´s Movement, the Peace Mothers, and the lawyers of Abdullah Öcalan. We have also met with HDP MP Leyla Güven, then on her 98th day of hunger strike. She said to us that her hunger strike is not an act of suicide, but rather an act of love for life; to be able to live with human dignity. We wish to amplify this message, and make it echo throughout parliament halls and congress chambers around the world. The sole demand of Ms. Güven, the 313 individuals on hunger strike in prisons across Turkey, and the other hunger strikers in Hewler, Strasbourg and Wales, is to end the isolation imposed on Abdullah Öcalan. This demand is ultimately a very simple one; that Turkey comply with and enforce its own laws. It is our firm belief that this critical situation could be changed for the better in a very short time, depending on the actions of the Turkish authorities. The ultimate reason for the hunger strikes, and the point we have heard repeated continuously by every group we have met with, is a just peace. It is ubiquitously believed that the first step to restart the peace process and realize a lasting peace is to end the policy of isolation imposed on Abdullah Öcalan and the other prisoners of İmralı Island. This is because Öcalan is recognized as the political representative of the people of Kurdistan, he has been a consistent and convincing voice calling for peace, and he has provided a detailed roadmap to achieve a peaceful resolution of the Kurdish question and a democratic settlement of the Middle Eastern conflict. The situation of the hunger strikers is at a dangerous point, and it is imperative that the government of Turkey acts to end the isolation now, before there is further violence and bloodshed. During our visit, many people have asked us how it could be that the world has remained so silent on the obvious human rights abuses in Turkey for so long. We share their astonishment and outrage, and moreover, we agree with them that the key to the solution of this critical and worsening situation lies in the hands of the Turkish government; all they must do is turn it.